Rather than paint, brushes, and canvas, artist Nick Cashmere creates intriguing works of art using unconventional tools applying striking images to wood. 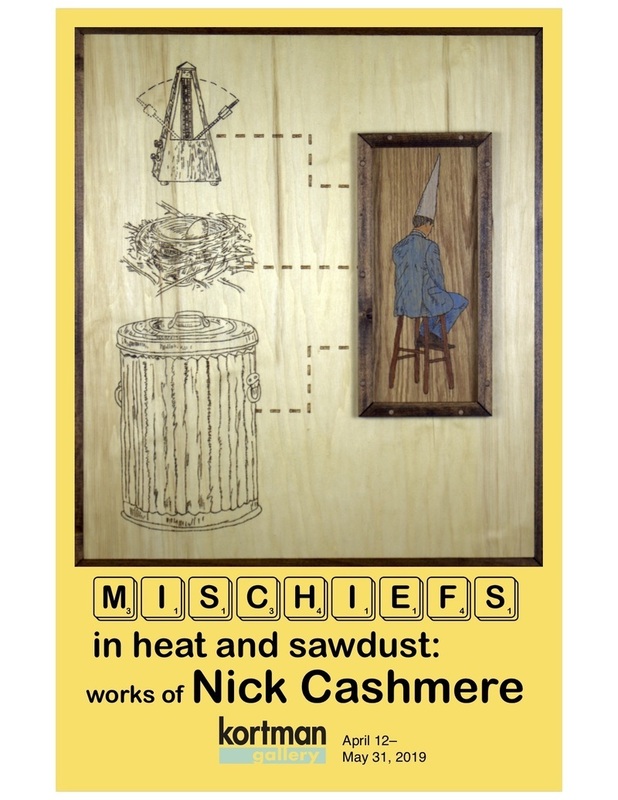 His unique mixed media art works can be seen in “Mischiefs in heat and sawdust: works of Nick Cashmere” opening Friday, April 12th in the Kortman Gallery in Downtown Rockford. Cashmere’s visual play on words are created with wood-burning tools, precisely cut 3-D applications, and off-beat drawn or photo images. Pulling this off, not only requires an artistic eye, but skilled craftsmanship. Cashmere has also created new works for this exhibition that are not only visually playful, but have hands-on, interactive components that let the viewer become actively engaged in his art. “Mischiefs in heat and sawdust: works of Nick Cashmere” will open during Spring ArtScene weekend in the Kortman Gallery with opening receptions on Friday, April 12th from 5 to 10pm, and Saturday 4-9pm. The gallery is located upstairs at J. R. Kortman Center for Design, 107 North Main Street in Downtown Rockford. The exhibit will run through May 31st. For more information call 815-968-0123.